WINDSOR SQUARE resident Carolyn Ramsay outside her office in Griffith Park. 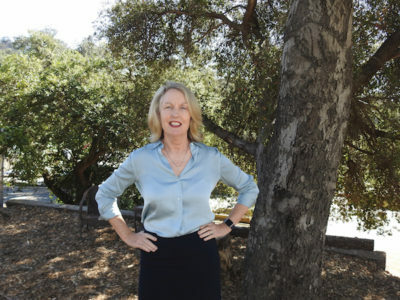 After a career in journalism, environmental advocacy and public service, Carolyn Ramsay has found her niche as executive director of the Los Angeles Parks Foundation. Her office amidst the oak trees in Griffith Park is a perfect setting for the Windsor Square resident, who has strived to bring greenery to her neighborhood and adopted city since she came here. “This is a fantastic job for me. It goes back to why I got involved in public service in the first place,” Ramsay said last month. Celebrating its 10th year, the Foundation is the fundraising arm for the city Dept. of Recreation and Parks. Ramsay has taken over the reins from founding executive director Judith Kieffer, who will be honored with the Foundation’s annual Rose Award Thurs., April 25 at 11:30 a.m. in the Exposition Park Rose Garden. “The event honors women who have made a significant, positive contribution to the life of our city,” said Ramsay. Kieffer has turned her attention to a hefty project: resurfacing the city parks’ 350 basketball courts by 2020, thanks to a $10 million grant from the L.A. Clippers Foundation. Ramsay’s history with the city’s leafy landscape started when she moved here in 1991. She loved the city and was excited to live here, she said, but as a young mother she was disappointed to find so little green space in the urban sprawl. California was the Connecticut native’s eighth state to call home, after growing up with her NBA Hall of Fame coach father, Jack Ramsay. Her husband, Andy Goodman, is a TV writer, while Carolyn worked as a freelance writer and reporter at the “Los Angeles Times.” At “People” magazine, she covered the red carpet at the Oscars and interviewed Steven Spielberg among others. As a young reporter, she called City Hall, and a young staffer for John Ferraro named Tom LaBonge answered. He offered to drive her around, and on the way gave her several story ideas, she recalled, smiling. Later, when LaBonge was elected councilman of the Fourth District, she returned to City Hall, first as his field deputy and later his communications director. She would leave to head up the Los Angeles office for The Trust for Public Land, and she later returned as Councilman LaBonge’s chief of staff, all the while keeping her sight on city parks. She worked on the pool and pool house upgrades and the newly opened soccer field at Pan Pacific Park, and she helped bring playground equipment to Robert Burns Park and landscape to a triangle-shaped island at Wilton Place and 2nd Street. After LaBonge was termed out, Ramsay ran for his seat, and while she didn’t win, she was endorsed by the Sierra Club for her advocacy work, which included founding the non-profit “Olive Branches,” which paid to convert paved-over school yards to green communal spaces. She joined early efforts to restore the Los Angeles River and helped in securing an additional 138 acres of open space, including Cahuenga Peak, for Griffith Park. A past president of the Windsor Square Association, Ramsay led neighborhood tours of drought-tolerant gardens, and, along with the board, raised funds for the jacaranda-lined median strip on South Larchmont Boulevard. The Larchmont median was the first project made with her “own personal vision,” she said. She would later be instrumental in creating a similar welcoming median strip on North Larchmont. 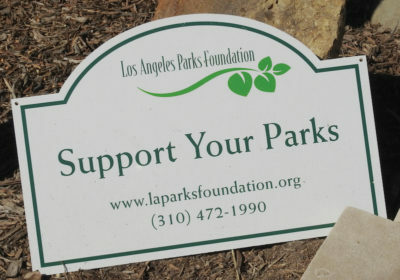 After the 2015 election, Ramsay focused on fundraising consulting, counting the Los Angeles Parks Foundation among her clients. Now, as its head, she works to raise the Foundation’s $3 million annual budget – from grants, corporate sponsors and private individuals — which pays to lay artificial turf at soccer fields, buy playground equipment and much more. “Playground equipment is a great way to improve a park. It makes it livelier and safer,” Ramsay said at her office in the refurbished home of a former Griffith Park caretaker. Foundation programs include the Girls Play L.A. afterschool sports program, a new archery range at Cheviot Hills Rec Center and soccer fields at Ferraro Fields in Griffith Park. She has a small staff at the Foundation, which was founded by Barry Sanders, an alumnus of the Library Foundation of Los Angeles, who saw the need for private financial help during the Great Recession when city parks were suffering. “Barry Sanders did a brilliant job starting this as a small non-profit… I feel very lucky to be in a position to help to expand it,” Ramsay said. The Foundation is instrumental to the success of the city’s 450 parks. Most older cities have longstanding private financial support systems in place. Los Angeles did not, until Barry Sanders and Judith Kieffer changed that 10 years ago. Ramsay is working to further that change. With 20+ years of experience behind her, she’s more than ready. THE FOUNDATION is instrumental to the success of the city’s 450 parks.